President Assad’s political and media advisor Wednesday told Lebanon-based media that her county is set to confront the US and its European allies amid their threats to strike the war-torn country following death of dozens of people in Eastern Ghouta following an alleged gas bomb attack by the embattled regime. 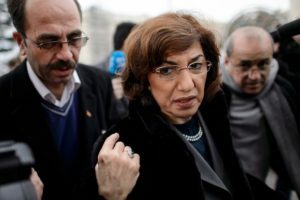 Buthaina Shaaban pointed out that Syria in the current state of affairs is far prepared than ever. “We are not afraid of war and we will be prepared for it if it happens,” Buthaina Shaaban told Lebanon’s Hezbollah-affiliated Al Mayadeen TV station. The regime of Bashar al-Assad has survived an internal conflict, which broke out 7 years ago. The Syrian regime has managed to keep head above water thanks to Russia’s intervention in 2015. The prospect of confrontation has risen following threats of direct clash between the US and Russia Wednesday. President Donald Trump promised smart response to Russia after the Russian military vowed to shoot down US missiles and launchers. “Get ready Russia, because they will be coming, nice and new and “smart!” Trump tweeted. US allies in Europe mainly France and the UK are reportedly mulling plans to hit the Syrian regime’s military facilities in the wake of the gas attack, which killed over 40 people in the rebel enclave. UK Prime Minister Theresa May has called for a cabinet snap consultation in a bid to seek her government approval. Shaaban said Syria and Russia pointed out that the two allies are prepared for US intervention. Posted by KanelkaTagba on Apr 12 2018. Filed under Headlines, World News. You can follow any responses to this entry through the RSS 2.0. Both comments and pings are currently closed.